Dance Commentary by Heather Desaulniers: The Hamburg Ballet - "Nijinsky"
The Hamburg Ballet - "Nijinsky"
Artistic Director Helgi Tomasson and the creative staff at San Francisco Ballet opted for something different with this season’s second program. They invited The Hamburg Ballet, under the direction of John Neumeier, to present the Northern Californian premiere of his “Nijinsky”. San Francisco Ballet fans absolutely loved Neumeier’s production of “The Little Mermaid”, so it’s not a huge surprise that his work is back on the War Memorial stage. But despite the rave reviews and resounding reception, his choreography is often tough for me. That is, until now. 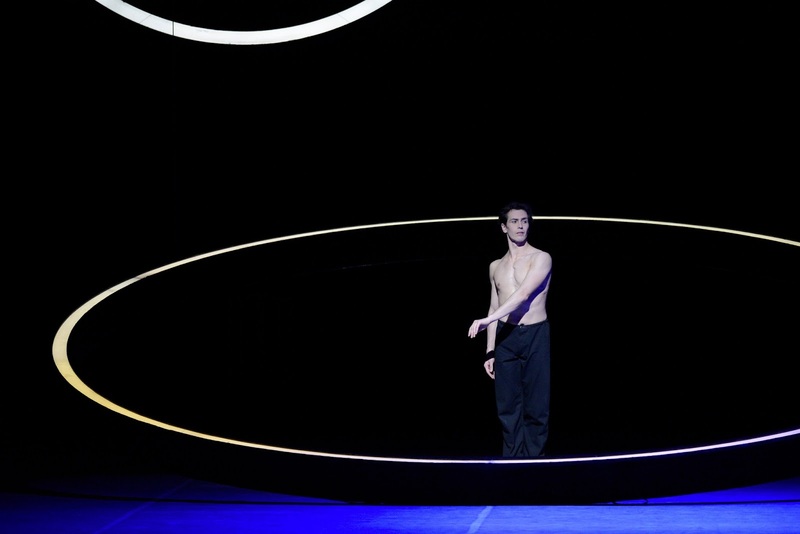 “Nijinsky” was amazing on all counts – the narrative communication, the character depth, the choreographic staging, the historical re-enactment. The San Francisco arts community is incredibly lucky that this thirteen-year-old ballet has finally arrived in Northern California. Neumeier’s epic story ballet began and ended with the same event - Nijinsky’s final public performance in 1919 - while the rest of the dance recalled, retold and replayed various moments from Nijinsky’s life. The good, the bad, the desperate and the tumultuous all came together to communicate this man’s personal and professional existence. Neumeier not only worked for chronological accuracy, but also attempted to convey the essence of this fantastically complicated individual. The resulting full-length work shows the difficult struggle between honest intention and created illusion, an equation that Nijinsky himself fought so desperately to balance. At this performance, the role of Nijinsky and his wife Romola were danced brilliantly by guest artists Guillaume Côté and Heather Ogden. Côté’s first solo was perfectly eerie. In it, we see Nijinsky haunted by emotion, haunted by circumstance, haunted by memories, and haunted by himself. Complexity was the name of the game and it came through everywhere; from Neumeier’s choreographic detail to Côté’s artistic interpretation, every decision onstage had layers of meaning. One important example came during this opening solo: a series of en dehors pirouettes and more specifically, the fifth position between each one. Technically, it is imperative to hit every one of those in-between fifth positions, in demi-plié, with both heels grounded to the floor (which Côté accomplished with purposeful specificity). But at the same time, those fifth positions also speak to Nijinsky’s own approach to ballet technique and training. This was a dancer who practiced and drilled every step to the nth degree, never settling for less than perfection. These fifth positions may have seemed like preparatory moments, but really they were character revelations. It is with them (and other similar examples) that Neumeier illustrated Nijinsky’s technical prowess and narrative truth. Lloyd Riggins in Neumeier's "Nijinsky"
Neumeier also fabricated a position of stillness and comfort for the Nijinsky character; a pose that resurfaced at many points throughout the ballet. Multiple times, Côté carefully placed his feet in first position and opened his arms wide to second. This stance became homebase; a place of strength, peace and composure. It was his sanity; his solitude; and his moment of introspection. Edvin Revazov as Serge Diaghilev gave another standout performance; a profound portrayal of the controlling puppet master. At the end of Act I, Revazov walked gracefully and coldly through a scene of dancers as if he was conducting his own personal orchestra. Côté and Ogden’s final pas de deux also deserves special mention. With it, Neumeier has choreographed a duet that is a physical representation of insanity – completely devastating, uncontrollable, inescapable and exhausting. Though not only related to this piece, The Hamburg Ballet company must be applauded for their accomplished stage presence and their commitment to varied physicality. From “Nijinsky’s” opening moments until the curtain fell, the entire cast looked so confident and at ease. Gestural miming was kept to a minimum and there was not even an inkling of overacting or melodramatic posturing – these dancers seemed like real people at real events in real relationships. Whether dancing a classical or contemporary variation or sitting watching the action center stage, there was a maturity and seasoned-ness to each moment of every dancer’s performance (not with respect to age, but definitely in terms of acumen). In addition, The Hamburg Ballet currently has a wonderful roster of varied dancers who are all technical proficients. And when making a ballet about a dancer who himself did not have the traditional ballet body type, having a company that is more mosaic and less cookie-cutter is not only helpful, it is necessary. Ballet San Jose - "Don Quixote"